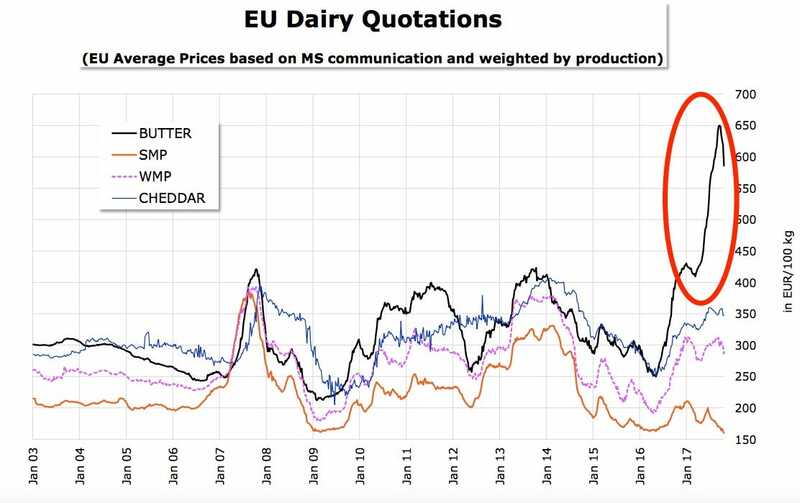 European butter price up around 50% so far this year. Supply hit by a poor harvest and falling exports globally, while demand from markets like China rising. France particularly badly hit, with shortages reported. LONDON — The price of butter is exploding in Europe, with a shortage hitting France, one of the continent’s biggest consumers. The price of 100kg of butter has jumped from just over €400 at the start of the year to close to €600, according to the EU’s Milk Market Observatory. Prices are rising amid a shortage of supply across the world. Rapidly rising butter prices in Britain are contributing to supermarket inflation of 3.2%, according to recent Kantar Worldpanel data, and France is facing a shortage of butter. What’s causing the butter crisis? Butter prices are rising mainly due to a squeeze on supply according to the BBC. New Zealand butter exports are down and a poor harvest in Europe last year had meant less animal feed for cows. The BBC said that rising demand for European-style pastries in China is also increasing demand for butter at a time when supply is falling. The shortage has hit France particularly hard because supermarkets have been reluctant to raise their prices to respond to the squeeze on supply. With supermarkets not paying more, producers are selling their butter abroad instead.